A visitor center rife with learning, history, and fun. 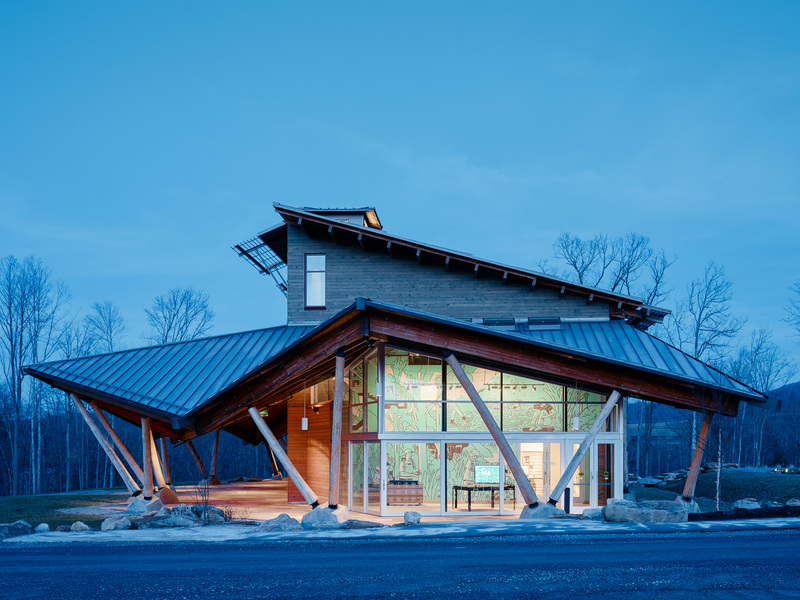 The Scott Visitor Center at the Boy Scout Summit Reserve in the mountains of West Virginia is the point of entry to the 10,000-acre high adventure camp (and a kind of Mecca if you ask any Scouts you know). The design of the arrival experience and exhibits required creating spaces with a reverence to the 100-year history of Scouting but also with a contemporary flair showing how the institution is as relevant today as always and will be for the next 100 years. Scouts never get tired of the Scout Law. Really. Here it is etched into the glass façade along with merit badges that were quickly redrawn to improve their legibility. The entry foyer is surrounded by a glass façade with the Scout Law and redrawn merit badges etched into it in unexpected and dramatic fashion. Inside this space visitors see a massive, brightly colored mural illustrating a number of the activities they’ll be able to do at the Summit and immediately setting the tone (“this isn’t Grandpa’s Scouting”). Visitors are also able to get oriented to the site with the large sculptural topographic map and a touch-screen map (a Scout in the mural holds the screen) that provides greater detail in exploring the property. Add your portrait to the 100-year timeline of Scouts. A simple photo station with a stool in front of it allows visitors to take a picture of themselves which is then displayed as a portrait on one of the screens built into the wall. Scouts can also email the photo home as a memento of their visit. Inside the exhibit space under a floating tent-like canopy, a variety of ephemera from throughout the history of Scouting is displayed (Baden Powell’s walking stick, an early copy of the Boy Scout handbook, a timeline of merit badge sashes and uniforms). Around the perimeter of the room, the 12 Scout laws become posters re-interpreted to appeal to today’s youth. There is a pin-a-patch wall where Scouts can leave their local troop patch behind to show they were there, a guess-the-merit-badge game (a merit badge for pigeon-raising?) and a photographic timeline of Scouts that visitors can contribute their own portrait to in real time via the photo station.